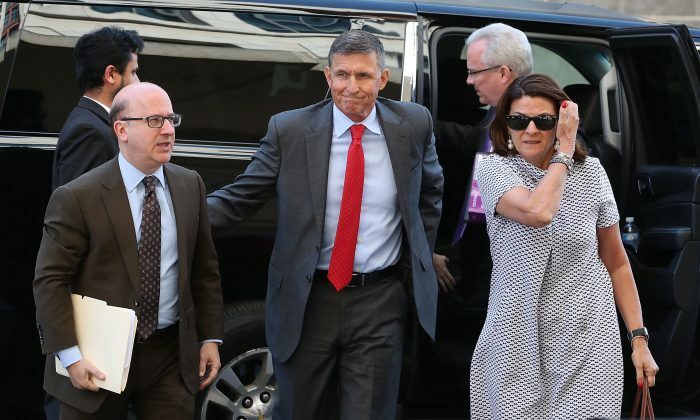 Special counsel Robert Mueller recommended no prison time for Lt. Gen. Michael Flynn who, in 2017, pleaded guilty to lying to the FBI and on his lobbying disclosure forms. Mueller’s team argued in a sentencing memo filed on Dec. 4 that Flynn cooperated with the federal government in multiple investigations and deserved “a sentence at the low end of the guideline range—including a sentence that does not impose a term of incarceration.” The guideline range pertinent to Flynn was zero to six months of imprisonment. “The defendant’s assistance to the government was substantial and merits consideration at sentencing,” the memo reads. Many specifics in the document were redacted, including some details about Flynn’s help with the special counsel probe, all details about his help with another criminal investigation, and his providing “useful information” on yet another matter that is also redacted. Based on the structure of the redactions, there could be a fourth matter Flynn assisted with. He participated in 19 interviews with the special counsel’s office and attorneys from other Justice Department offices. He also provided documents and communications for investigations that are still ongoing, the memo stated. Flynn used to head the Defense Intelligence Agency from 2012 to 2014 and advised the presidential campaign of Donald Trump in 2016. He was tasked with contacting foreign dignitaries as part of Trump’s transition team and was then named national security adviser in the administration. His term was short lived, though. On Jan. 24, 2017, he was visited by two FBI agents, Joe Pientka and, reportedly, Peter Strzok. Flynn agreed to talk to them. The agents asked about Flynn’s contacts with Russian Ambassador Sergey Kislyak, with whom Flynn spoke multiple times as part of his transition work. As it later emerged in court documents (pdf), Flynn asked Kislyak to ensure Russia did not escalate the situation after then-President Barack Obama imposed additional sanctions on Russia. He also asked Russia to vote against or delay the vote on Egypt’s resolution to the U.N. Security Council regarding Israeli settlements in the West Bank and East Jerusalem. Flynn later acknowledged he lied to the agents about the two requests, in a Nov. 30, 2017, guilty plea. He also pleaded to lying on his foreign lobbying disclosures about the extent to which his work for the Turkish government was overseen by that government. Foreign lobbying paperwork violations are seldom prosecuted. Flynn said the work started in August 2016. He shut down his lobbying firm in November 2016. Trump accepted Flynn’s resignation on Feb. 13, 2017, after then-Acting Attorney General Sally Yates informed White House counsel Don McGahn that Flynn misled Vice President Mike Pence about the content of his calls with Kislyak. Mueller was appointed in 2017 to probe allegations that the Trump campaign colluded with the Russian government to sway the 2016 election. He’s produced a slew of indictments, but none has substantiated the original allegations. Sen. Chuck Grassley (R-Iowa), chairman of the Senate Intelligence Committee, raised questions about what happened during the Flynn interview in a May 11 letter to Deputy Attorney General Rod Rosenstein and FBI Director Christopher Wray. The agents who interviewed Flynn “saw nothing that led them to believe [he was] lying,” then-FBI Director James Comey told the Senate judiciary committee on March 15, 2017, according to a law enforcement agent on detail to the committee who took notes of Comey’s briefing, Grassley said. “Agents saw no change in [Flynn’s] demeanor or tone that would say he was being untruthful,” the committee staff’s own notes said, according to Grassley’s letter. Comey denied saying so. Flynn may have been under pressure to cut a deal with Mueller to protect his son with whom he ran the lobbying business. The Mueller team was putting pressure on Flynn, threatening that his son may be implicated, too, NBC News reported in November 2017. Later that month, Flynn entered his plea. No charges were brought against his son. Rep. Matt Gaetz (R-Fla.), who sits on the House judiciary committee, said the charge against Flynn wouldn’t have held in court because one of the agents who interviewed Flynn was Strzok, who was fired from the Mueller team after text messages with his mistress, then-FBI lawyer Lisa Page, revealed animus against Trump. “Michael Flynn won’t be facing any prison time, but he would have faced no legal jeopardy at all if he just wouldn’t have pleaded guilty because they would have never gotten a conviction with Peter Strzok as their star witness,” Gaetz told Fox News on Dec. 4.